In Silverlake... Hipster at the Top of the Key: Hey, "pass" me "the ball." Hipster with the Ball: Hold on, man. I'm going to try that hook shot Kareem used to do in the 80s. Style was so much cooler back then. Not to mention, I liked Kareem better back when he was Lew Alcindor. 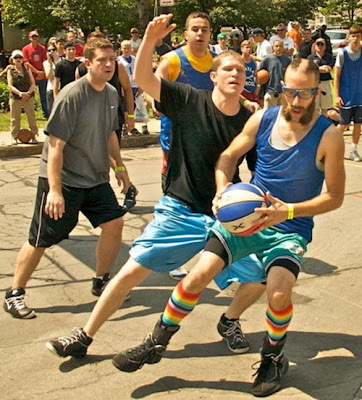 Hipster with the Ball: Foul. Chill out, this isn't a Limp Bizkit concert. Man in Disguise: Hey guys. Mind if I play? Hipster Coach: Whatever, man. We can't tell you what you can or can't do. That's why we're in this league. We have the freedom that teams in major sports leagues don't have. That makes our brand of basketball a lot more authentic than those sell-outs. 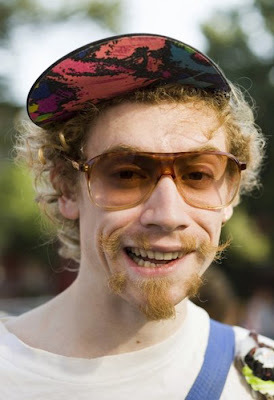 Hipster Coach: You need to relax, man. If you haven't noticed, we're trying to play with a detached sense of ironic cool. You're playing like a real bro. Man in Disguise: I have to confess. 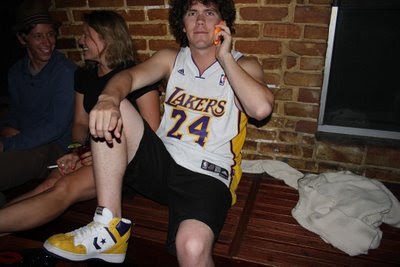 I'm Luke Walton of the Los Angeles Lakers. I'm just trying to get in shape for the season, and I happened to see you guys playing out here. I got this mustache and bandana so I could fit in. No one wants to actually stand out. Hipster Coach: Cool, man. We all love your dad. There's a few of us out here who look like him. Luke Walton: I've noticed. Kind of weirds me out. He wasn't a great looking man. Hipster Coach: You just don't understand us. 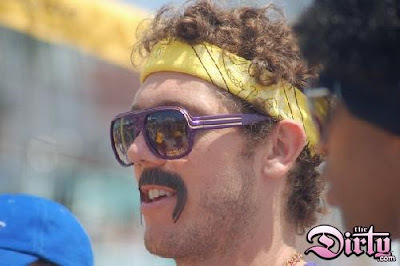 Luke Walton: That's probably true, for I am a Bro at heart. I'll be going now. Phone rings playing "Lovegame"... Hipster Knicks Fan: What? Hipster Lakers Fan: You're not going to believe this. Luke Walton just came down to play at Silverlake. Then he left. Hipster Knicks Fan: Of course he did. It's just like the Lakers to try and co-opt the counter culture. I'm so over the Lakers. Hipster Knicks Fan: Sell out. Can't believe Man In Disguise didn't miss a wide open layup when he should have dunked. And is that Rick Bucher checking Stripes in the first photo? Tremendous, although, I'm a little surprised that no one wore an 'ironic' jersey like Kelly Tripucka or something.